ReTargeter is a powerful marketing product designed to fully maximize ad spending by effectively building business brands and nabbing their most qualified site visitors with the highest probability to convert. ReTargeter delivers highly targeted, real-time digital advertising solutions and the best account management in the industry. Simply put, ReTargeter gives you that platform where you can get the most out of your marketing strategies by serving targeted display ads to the right people at the most opportune time. That means your brand, products, and services are always in front of your high value targets, ensuring that your brand stays on top of your target audience’s minds. The app encourages return visits and improves conversion as well as return business. With ReTargeter, businesses have a string of smart and powerful real-time advertising solutions that helps them target the high value audiences that have the highest probability to convert. By delivering smart, timely digital ads to the right people, your brand or product remains relevant to your target audience, ensuring high conversion rates as well as return businesses in the process. 95% of the time, your website visitors leave your site without making a purchase or inputting information on your form. In short, the majority of them exit your site without taking the desired actions you want them to do. ReTargeter changes all that by ensuring your brand remains relevant to your website visitors even after they leave your site. 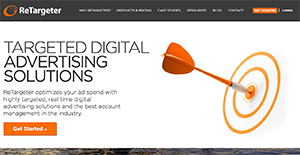 ReTargeter digital advertising solutions are built with your website visitors in mind. Site retargeting ensures that your ads are always present to your website visitors all the time. Facebook has become an essential advertising platform, a potent ingredient to the success of any eCommerce endeavor. With ReTargeter for Facebook, you have a bidding platform that displays retargeted ads to your website visitors across Facebook. All in real time. For those who want to implement accurate marketing strategies, ReTargeter also offers audience targeting solution. This particular service employs the use of demographic, geographic, behavioral, contextual, interest, and intent-based data to find your ideal audience and present them relevant and timely ads. The system uses a powerful media buying platform to display ads all over the web. Enterprises have unique wants and requirements and no software platform can be ideal in such a scenario. It is futile to try to find an ideal off-the-shelf software product that fulfills all your business needs. The intelligent thing to do would be to adapt the application for your unique requirements, worker skill levels, budget, and other aspects. For these reasons, do not rush and pay for well-publicized leading systems. Though these may be widely used, they may not be the ideal fit for your particular needs. Do your groundwork, investigate each short-listed application in detail, read a few ReTargeter reviews, call the vendor for clarifications, and finally settle for the application that provides what you require. How Much Does ReTargeter Cost? We realize that when you make a decision to buy Marketing Software it’s important not only to see how experts evaluate it in their reviews, but also to find out if the real people and companies that buy it are actually satisfied with the product. That’s why we’ve created our behavior-based Customer Satisfaction Algorithm™ that gathers customer reviews, comments and ReTargeter reviews across a wide range of social media sites. The data is then presented in an easy to digest form showing how many people had positive and negative experience with ReTargeter. With that information at hand you should be equipped to make an informed buying decision that you won’t regret. What are ReTargeter pricing details? What integrations are available for ReTargeter?